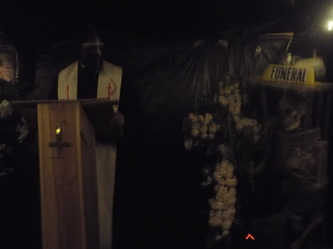 To be frank, there are pay haunts that could take some lessons from Resurrection Graveyard. 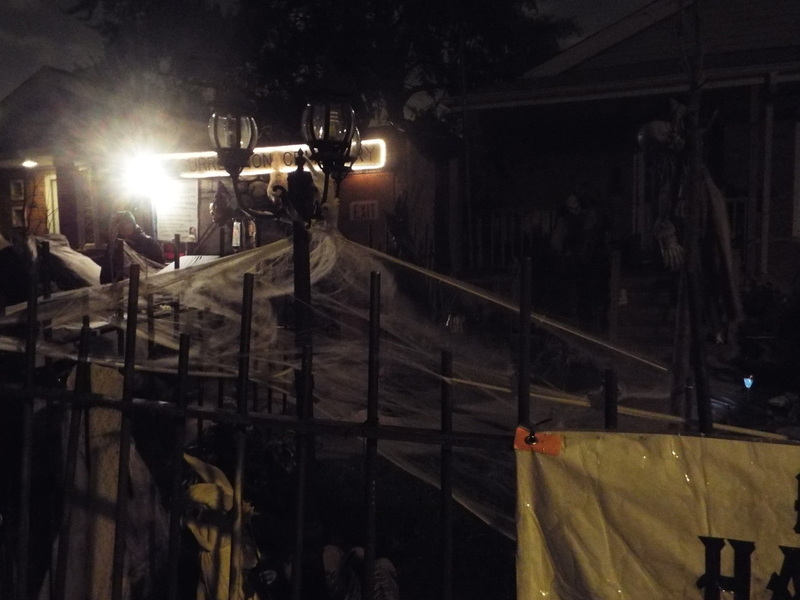 We say "pay haunts" and not "professional haunts" as we don't want to give the impression that Resurrection Graveyard is not professional - it is, no question about it. 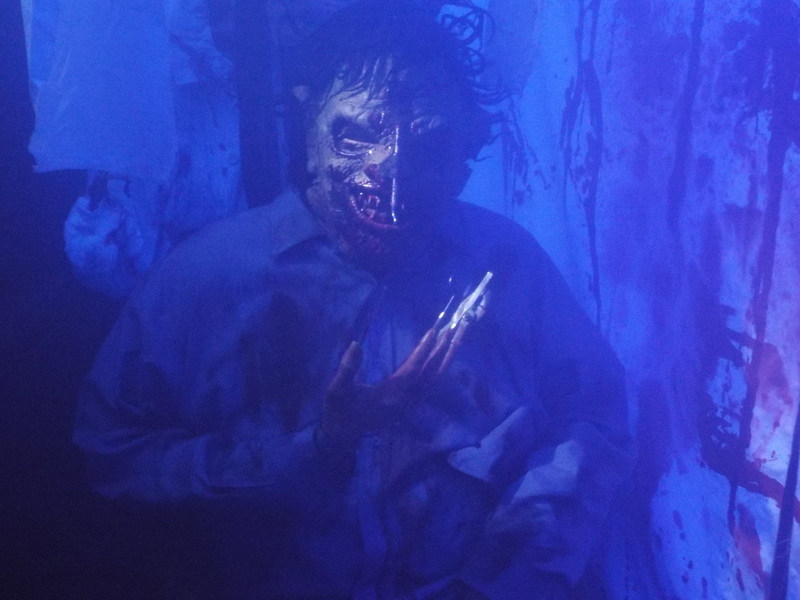 From the moment visitors approach, they can tell that there's something creepy about the haunt. 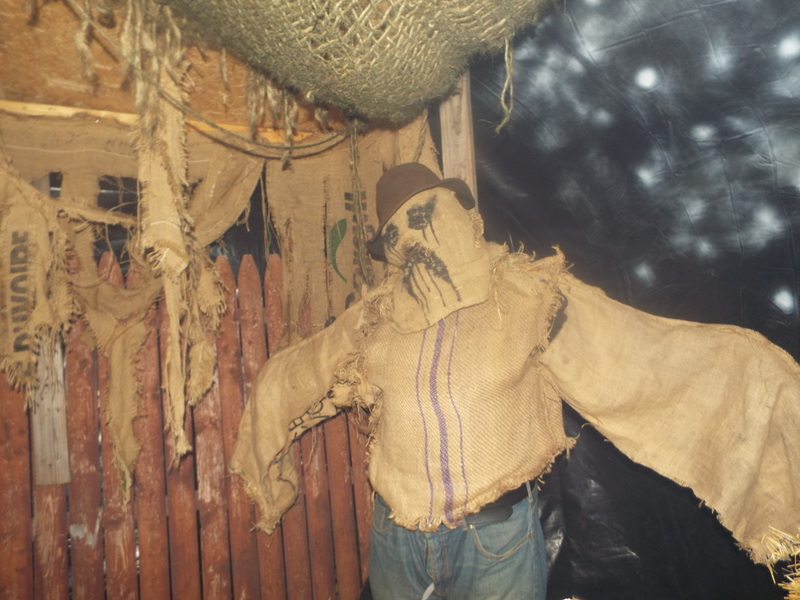 Perhaps it's the somewhat secluded location or the dilapidated nature of the outside, or perhaps it's the crazy live actors who often terrorize visitors before they even manage to get inside. Whatever it is, the creepiness factor is already at a heightened level before anything happens. 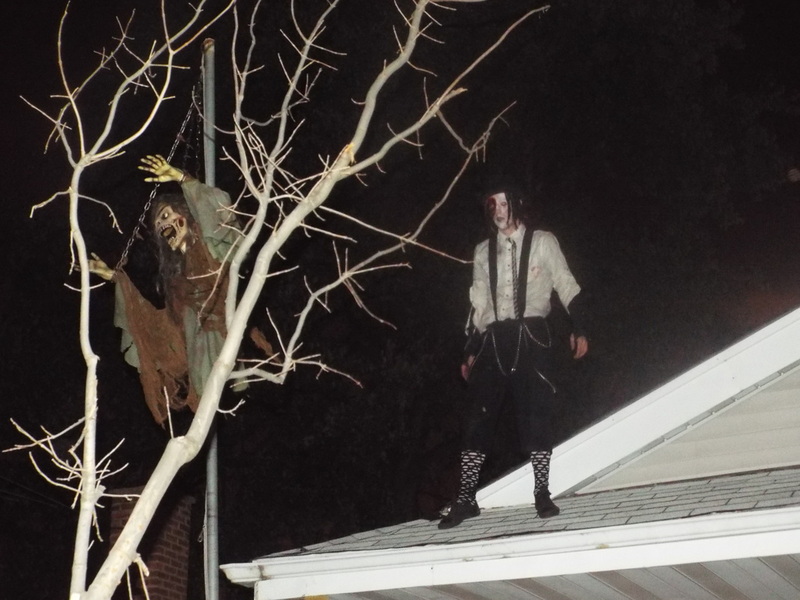 The haunt itself is built right on the side of the owner's property, in the driveway. While it might sound a bit odd, once you get inside you won't be thinking "oh, this is just some guy's driveway" - there are many rooms indie the haunt, and all of them are detailed and loaded with live actors. 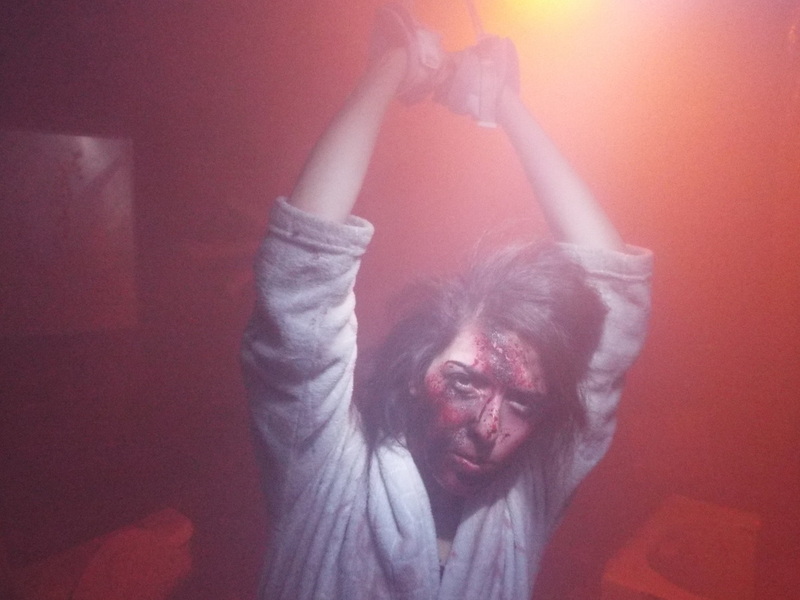 We counted at least 16, including an asylum scene, a funeral scene, a creepy dentist, a cool swamp scene, and more. Again, there are many pay haunts out there that do not have as many rooms. 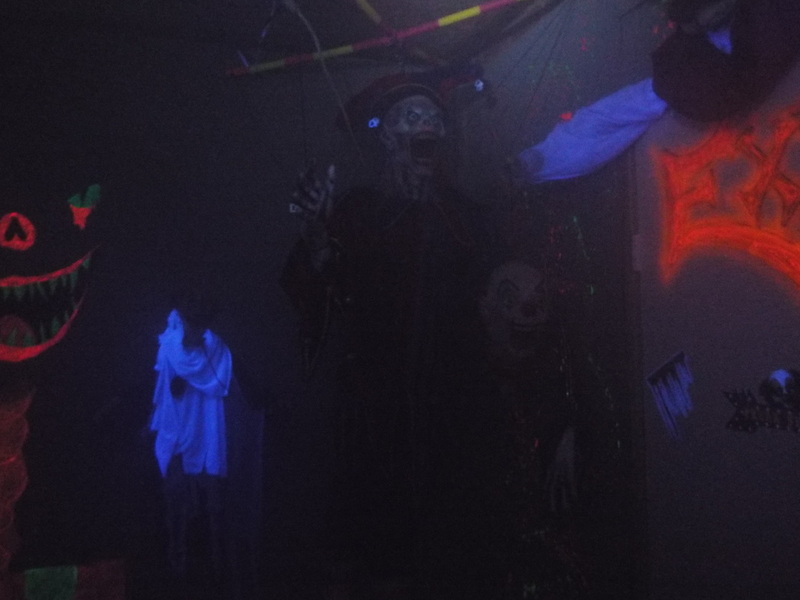 Each of the rooms had a different theme, and most had some specific type of scare that added to the mix. 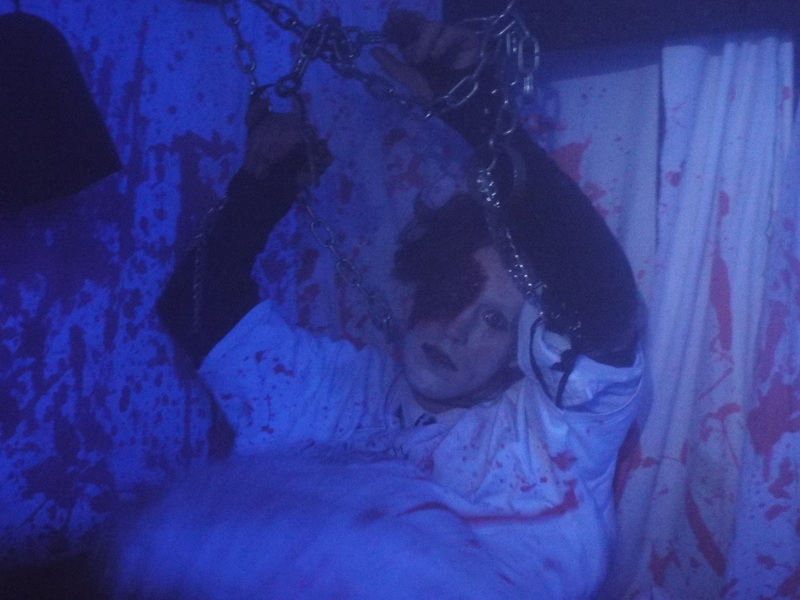 Special mention must be given to the live actors, who do their best to make each scene intense and unnerving, even to the most veteran of haunt goers. All of them have excellent makeup, with our favorite being a nurse with a bandaged face and a syringe sticking out of her eye and a creepy marionette chained to a wall. 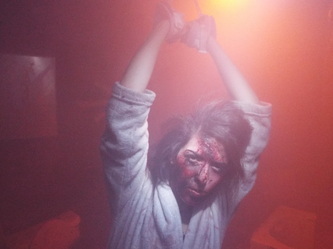 Also, each of the actors has unique movements and voices that distinguish them from one another. For example, the aforementioned nurse has a stilted, awkward walk and an insane cackling laugh that sounds like a cross between a maniac and a chimpanzee, and the swamp monster has a strange, labored breathing sound that almost sounds as if he has water in his lungs (most appropriate for a swamp creature). All in all, there is a large variety in the types of live actors, which keeps things interesting and had us looking forward to seeing what new sights awaited us in each new room we visited. While the atmosphere is not morose and depressing over overly psychotic as some haunts can be, there is enough of the "in your face" factor to keep it scary while at the same time there are does of good humor and clever surprises that make it entertaining and fun, and that's an excellent mix. The actors are a large part of this, so kudos to them. 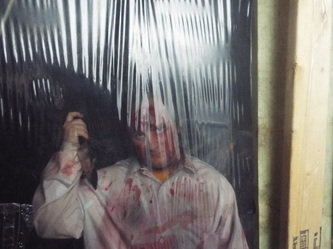 For each room, there is usually a scare in front of you, behind you, and sometimes even to the side of you, so for those of you who think that you can hide in the back or even in the middle of a group - think again! The fun begins in the first room, which is set up like a church. Visitors take their seats and are given the rules by a live actor, followed by surprise which we won't spoil here. 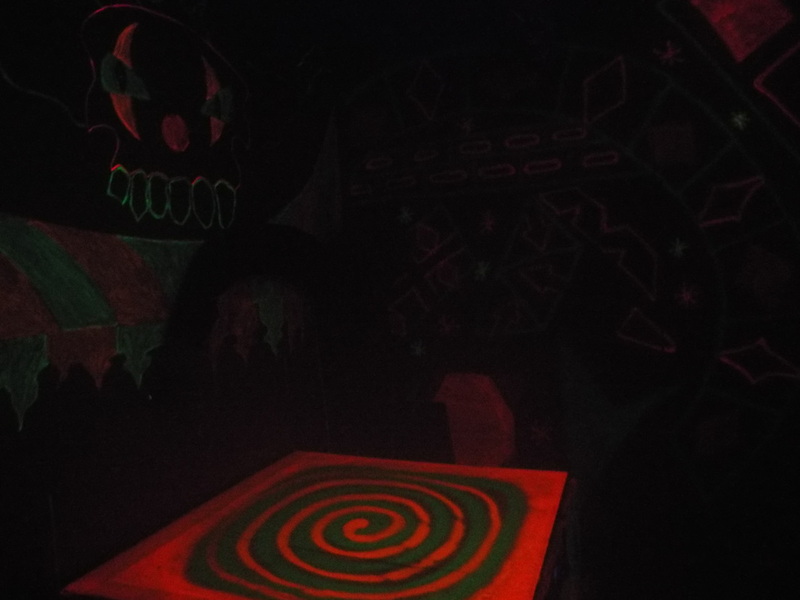 After that, visitors enter the haunt proper, where the surprises continue, all the way to the very last room. 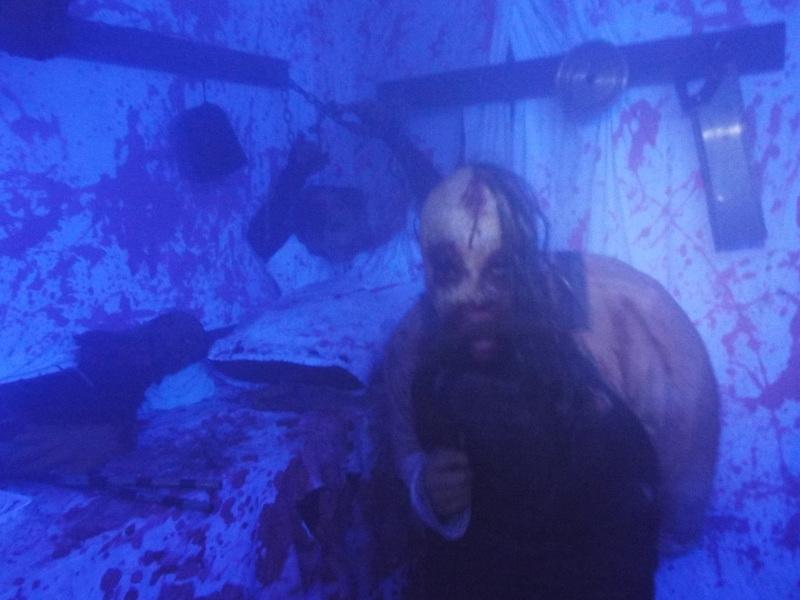 Again, we won't give away any big surprises, but we do have to mention some of our favorite rooms, which include a swamp area populated by a very unusual and creepy live actor, a dentist's examination area with a dentist who keeps his tools permanently attached to his hand (and his face! 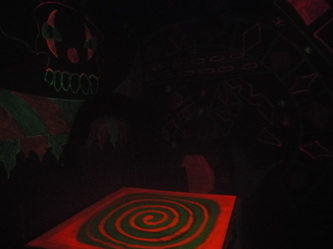 ), and a glow in the dark clown room. 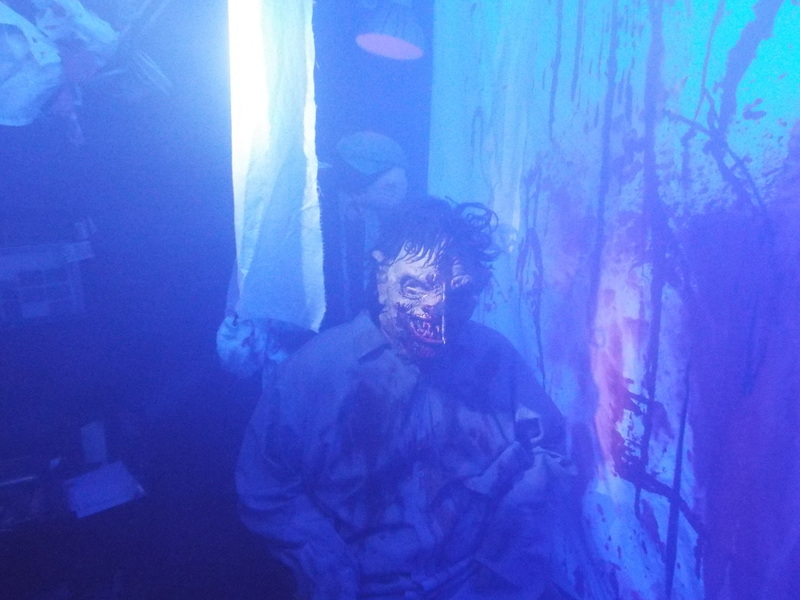 One of the best tricks in the haunt is a long corridor with a strobe light at the end that partially blinds visitors. This is something we see quite often in haunts - the strobe light blinds visitors to the surprise that is usually waiting for them at the end of the corridor. However, in Resurrection Graveyard, it's not what's in front of you that you need to watch out for, but rather what's crawling along the wall behind you. 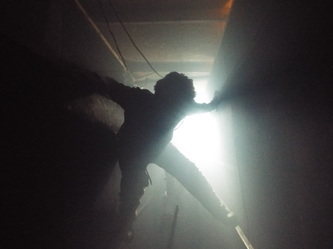 While distracted by the light, a live actor scales the walls from behind, sneaking up on visitors, who turn to see him in their faces from behind and above them - it's a very cleverly realized scare, and one of our favorite things we've seen in any haunt we've been to. 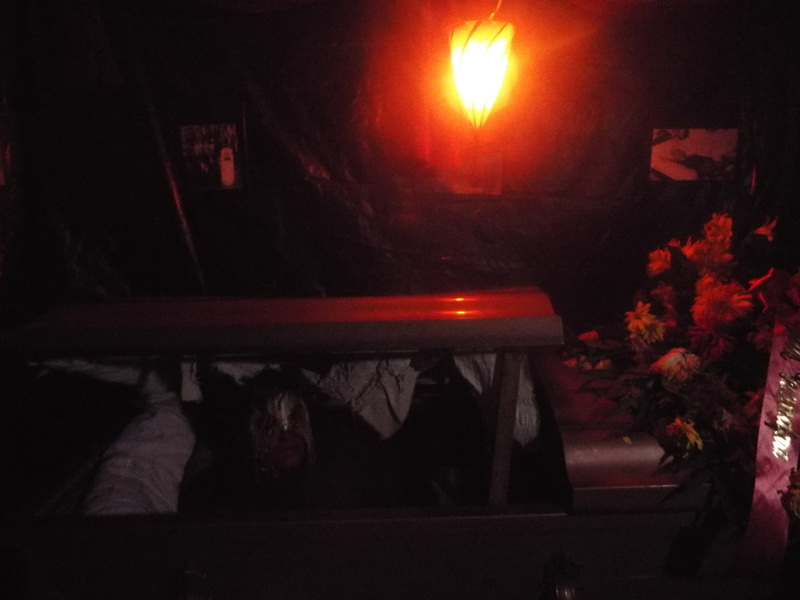 Also, one thing that is interesting about Resurrection Graveyard is that the haunt experience is different each time you visit (and we strongly suggest visiting more than once a season). Actors are different and in different locations within the haunt, and scenes are subtly changed so that each experience, while similar, is unique. We like Resurrection Graveyard so much that, each year, we vow to visit a second time before the season ends. 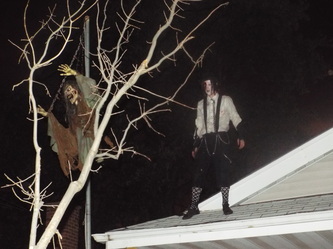 While we haven't been able to do that every year, we made a special point of doing it in 2013 as we had a new Horror Tourer (Michael) with us who had never been there before. 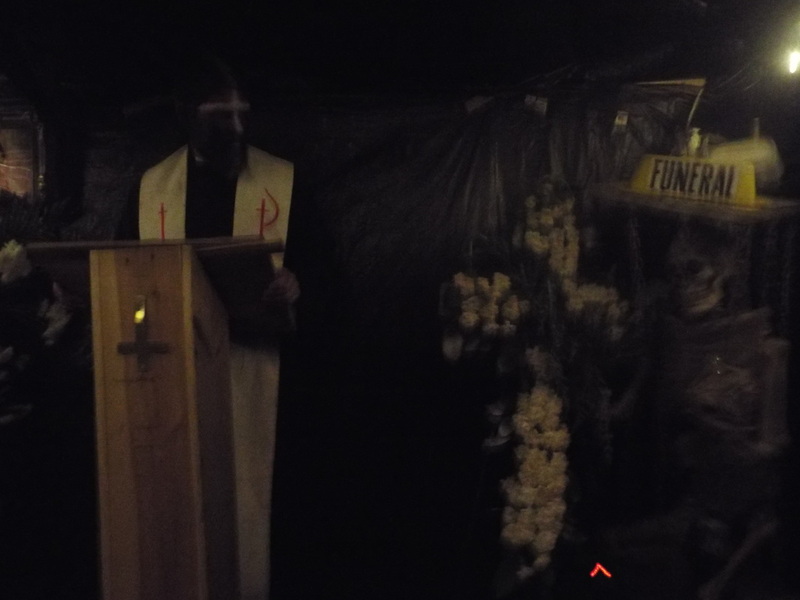 While Michael has survived many a haunt, we just knew that the Resurrection Graveyard experience might possibly require him to bring a change of clothes along, so we were most interested to see what happened. In short, we were not disappointed. 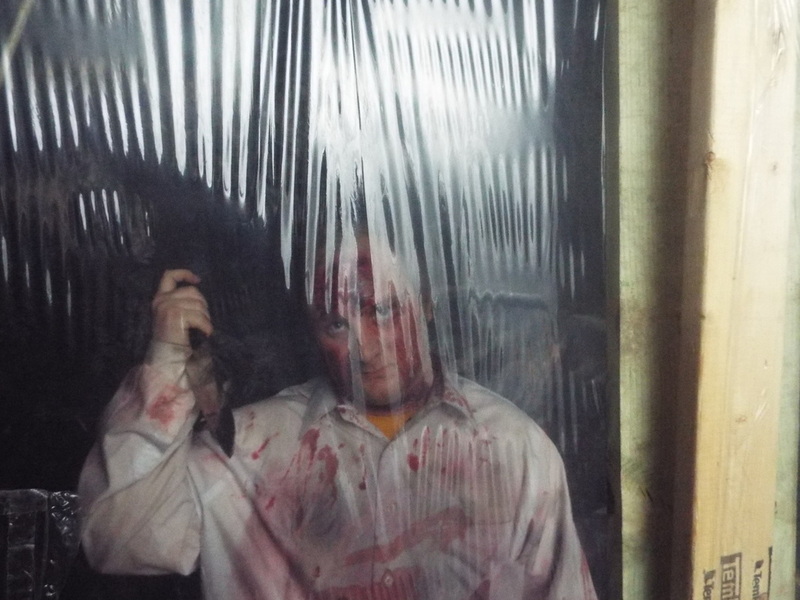 Whilst Michael made it through, he was certainly glad to finally find the exit, and his hands were clasped, as if in prayer, the entire time, which only made him more of a target! We could go on and on about how fantastic this haunt is, but it's probably easier to just say "go see it." Make sure it's on your list each and every year. Bring your friends, bring people you don't like and give them a scare so you can laugh at them; bring innocent victims who've never been there before (we did!) - it's just that good. 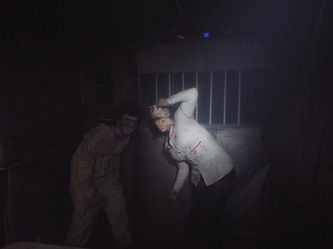 Everyone there is like a family, and you can see the dedication and enthusiasm that everyone brings to the haunt experience. 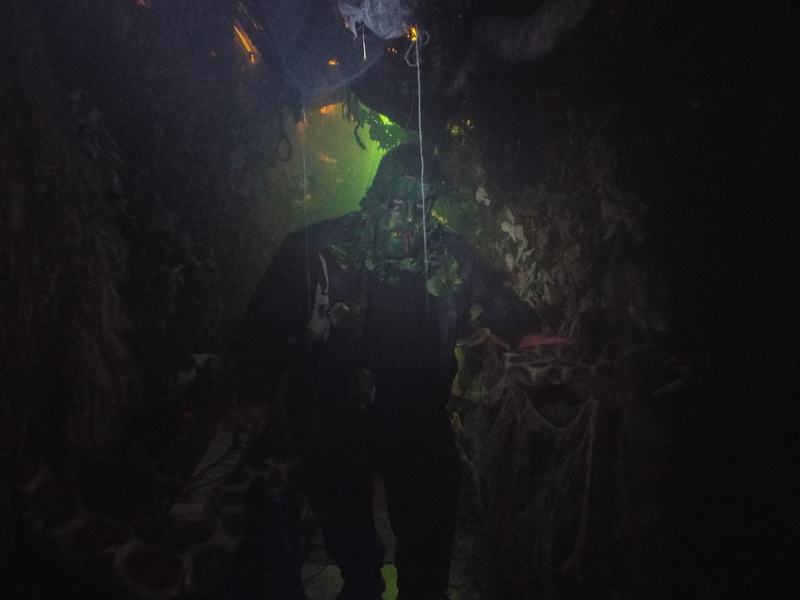 .While a dysfunctional, creepy, and perhaps homicidal "family" exists inside the haunt, there's another one outside in the real world that brings it all together and provides a uniquely enjoyable haunt experience for visitors. If we had awards to give out, we'd have to say that Resurrection Graveyard tops our list as our favorite home haunt of the 2013 season, and it's one of our favorite haunt experiences out of all of the dozens and dozens of haunts we've been two over the many years that we have been doing this. Simply outstanding!